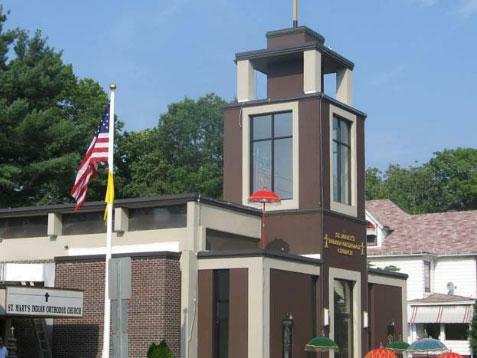 At the beginning of 1995, few concerned members from St. John’s Orthodox Church of New City and St. Peter’s and St. Paul’s Orthodox Church of Sparkill Churches got together and discussed whether we needed two Orthodox churches in Rockland County. It was pointed out that only a single Church of ours in Rockland County would have a great potential to grow as the most affluent Indian Orthodox Church in the world. Our children can enjoy a well-run Sunday school, well-organized Students Movement and Women’s Group, etc. Thus, we unanimously decided and were determined to stand together strong and pass our faith, heritage and culture to our children. The majority of the members who came to the meeting welcomed the idea of a merger of the two churches. That led to several meetings of representatives from both churches. There were several telephone calls and at least eight official and unofficial meetings were held at different places to discuss about the possible merger. Although the majority of the members were agreeable to a merger, due to some administrative problems the merger did not take place at that time. Although the merger did not take place in 1995, concerned members of both churches maintained close contact, having anticipated the future merger. First there were two; now there is one … The St. Mary’s Indian Orthodox Church of Rockland has a unique and rich heritage, from the union of two former parishes. In August 1998, the two Churches met again and decided to merge. Accordingly, we informed the Metropolitan of our interest and he sent a Kalpana (No. K 77/98) on August 27th 1998, to both churches for a Joint Managing Committee and Board of Trustees meeting. The joint meeting was held on Monday, September 7th 1998 at the Aramana Conference hall. Fifteen members from St. John’s Church and eleven members from St. Peter’s & St. Paul’s Church attended the meeting. The meeting was blessed by the presence of Very Rev. Yuhanon Ramban, Rev. Fr. Paulose Adai and Rev. Fr. K.K. Kuriakose. After consultations, coordinators from both churches unanimously agreed to an unconditional merger. The Metropolitan made ten proposals for a smooth merger and the members unanimously agreed. Accordingly, the joint committee decided to have a combined Holy Qurbana on Sunday, September 27th 1998 at St. Peter’s and St. Paul’s Church, Sparkill. Thus, the long cherished wish of the members of St. Peter’s & St. Paul’s Church of Sparkill and St. John’s Church of New City became a reality with the unconditional merger as St. Mary’s Indian Orthodox Church of Rockland on September 27th 1998, by order No. K. No.80/98 of the Metropolitan, H.G. Mathews Mar Barnabas. It was not only a great accomplishment and achievement for the Orthodox Christians but for all the Christian communities, when two churches in Rockland Country unconditionally merged on September 27, 1998. This merger turned around the history trend and it should set an example to the Christian communities here and in India. In order to strengthen the merger the first item on our agenda was to acquire a church building for our parish. Accordingly, a special general body meeting was held at the New City Methodist Church on Sunday, August 1st 1999 to discuss ways and means to purchase a building to be used for our early morning Sunday service and especially decided that the Holy Week Services for the year 2000 must be celebrated in the new church building. A church building committee was formed and started looking for a place suitable to our needs. The destiny of St. Mary’s Church began taking new shape when we were informed that a suitable building was for sale in the city of Suffern. After intense negotiations and consultations the general body unanimously decided to purchase the Suffern Free Library Building for our church use and an adjacent building with basement for the Sunday school and other spiritual activities, located at 66 E. Maple Ave, Suffern, New Yor. Since our church did not have sufficient funds in hand for the purchase of the building, the officials of the church mobilized the members by contacting each parish member and getting their pledges to accomplish this venture. The response from the parishioners was more than encouraging. Thanks to each and every member and the well wishers outside the parish for their generous contributions to the building fund. Special thanks are also due to those who went an extra mile by coming up with additional donations, without which, our dream of owning a church building of our own would have remained just a dream. By the Grace of God, without any exaggeration, exactly one year to the day after the merger, an initial contract was signed on Thursday, September 2nd 1999 and a down payment check was made to Balsamo, Byrne & Cipriani, attorneys of the seller. Raising the required money in a short period of time was an unthinkable proposition, but the members of this church were determined to go ahead and they did not rest until they gathered enough funds to buy this beautiful church building. The long cherished wish of the members of St. Mary’s Church became a reality just three days before Palm Sunday on Thursday, April 13th 2000 with the purchase of the landmark Suffern Free Library Building and the adjacent two-story building for our church use in the heart of the City of Suffern, New York. Since the Church needed extensive cleaning, removal of the mezzanine and other repairs, all members worked shoulder-to-shoulder, men, women and children, each contributing his or her share. Those who went to the extent of even taking time off from work to volunteer their services to the church are to be deeply appreciated. They were full of enthusiasm, working day and night like bees around their beehive. It must also be cited with profound gratitude, was that many members came forward with money and materials for the different types of jobs that had to be done in order to get the church ready for the Holy Week Service. Numerous items, small and big had to be purchased or received as gifts to the church. The church was furnished with brand new chairs. All the necessary work was completed by Palm Sunday, April 16th 2000. By the grace of God, as we have decided a year ago, on Palm Sunday evening we officially started with an evening prayer followed by Holy Confession in our new church, joined by Rev. Fr. Paulose Adai, Rev. Fr. T.P. Elias along with our then Vicar Rev. Dr. K. K. Kuriakose. The Metropolitan, H.G. Mathews Mar Barnabas blessed the building on Tuesday, April 18th 2000. The first Holy Qurbana was celebrated on Maundy Thurday, April 19th 2000 by our then Vicar Rev. Dr. K. K. Kuriakose. This was followed by Good Friday and Easter service. By the Grace of God, thus we fulfilled our dream of owning our own Church and conducting the Holy week celebration in the year 2000. Although, we faced many obstacles, hardships and problems at the beginning, our parish stands as a shining star in the midst of others. All the members of St. Mary’s Orthodox Church can be proud of their joint accomplishments. In this adopted land, we, the first generation, are trying to settle down and establish our identity so that life will be easier for the next generation. His Grace Mathews Mar Barnabas Metropolitan performed the consecration service exactly two years after the merger on September 27th, 2000. Metropolitan of Kottayam Diocese H.G. Geevarghese Mar Ivanios and the Asst. Metropolitan of Madras & Malabar Diocese H.G. Yacob Mar Iranios assisted Barnabas Thirumeni in the consecration ceremony.